In addition to the programs listed below, the State Bar offers the convenience of inexpensive, high-quality online CLE on a wide array of topics, available anytime. And you can take written self-study tests online, both through the California Bar eJournal (see the link in the left column) and the State Bar Sections. 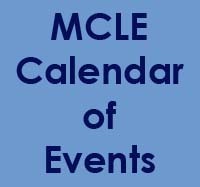 The State Bar of California is a State Bar of California-approved MCLE provider.